Unfortunate thing about the Viswa Sadasivan episode is one of lost opportunity. Andrew Loh. Whenever MM Lee steps out and demolish, to use his own word, someone else’s ideas, he does so with much effect. Whether that effect is a positive or beneficial one is open to debate. What is not, perhaps, is that when MM Lee comes out forcefully, virtually everyone steps into line – immediately. The latest example of this is, of course, MM Lee’s criticism of NMP Viswa Sadasivan’s speech in Parliament recently. Delivered in quintessential Lee Kuan Yew style – deliberate and persuasive – MM Lee called Mr Viswa’s speech “highfalutin ideas” which needed to be “demolished”. The House fell silent as MM Lee spoke. Such is the respect – some would call it fear – that MM Lee still commands. The unfortunate thing about the episode is, perhaps, not that MM Lee rubbished Mr Viswa’s ideas but that Mr Viswa’s ideas are not exposed to a fuller debate after MM Lee had spoken against them. The end result is what MM Lee and his colleagues in Cabinet have lamented all along – a disinterested populace. A people who, seeing how easy it is for the establishment to put your views and ideas down, and to do so with so much ease, becomes either frightened or gives up trying. Ironically, it was MM Lee himself who expressed such fears most eloquently in 1997. “Supposing I’m now 21, 22, what would I do? I would not be absorbed in wanting to change life in Singapore. I’m not responsible for Singapore…Why should I go and undertake this job and spend my whole life pushing this for a lot of people for whom nothing is good enough? 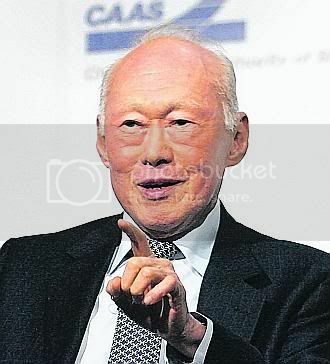 I will have a fall-back position, which many are doing – have a house in Perth or Vancouver or Sydney, or an apartment in London, in case I need some place suddenly, and think about whether I go on to America.” – SM Lee Kuan Yew, The Man & His Ideas, 1997. I am not saying that MM Lee should pull his punches. That’s wishful thinking. The man’s political views took form in the cauldron of nationalism, by battles in the trenches, and in surviving the fire of baptism. Moderate rebuttals are not synonymous with a man who once boasted of wielding a hatchet in his bag. Nah, MM Lee’s robust style is character given birth by having been pushed to a cul de sac – and having to emerge from it victorious, or perish. Yet times have changed and society must too. While MM Lee may retain his robust style, society must not defer to this, at least not always. Singapore and Singaporeans have reached a stage where mere rhetoric no longer suffices, no matter how forcefully it is delivered. Indeed, we have to and need to move beyond being awed by one man. The unquestioning deference which Singaporeans have paid to MM Lee all these years no longer will stand the country in good staid. Yet, let us not confuse deference with respect. Deference to MM Lee means we do so because of his contribution to Singapore, his wisdom, or his authority in government, these past 50 years. And perhaps at times it is right that we should. But when it comes to things of the nation, how we want to be, what values we want to have, the future that we imagine for ourselves and our children, deference to one man’s views resulting in a shut-down of discussions on these issues of national importance, clearly, can only do more harm than good. It numbs the mind from daring to dream. We defer to others, and end up with small minds which no longer can envision something better, bigger, grander. We should allow ideas such as Mr Viswa’s to be fully and openly debated and discussed in our society, in the media, schools, online. We should be conducting public forums, speaking to politicians and academics, activists and ordinary Singaporeans about these things. Indeed, we should kick up a ruckus over the issues which Mr Viswa has brought up because they are important issues. How fair should our electoral system be? How should a nation such as ours treat the minority races? How do we rid ourselves of the fear of being involved in politics? Why are so many leaving us? Why do even our children want to leave this land? What kind of roles should our media play? Is government control of the media doing harm to our country? What does being Singaporean mean? Why do we not put down stakes on this land and claim it as our own? These are not highfalutin ideas. These could be the reality we will live – long after MM Lee has gone from the scene. And because of this, we must cast aside deference to MM Lee and have the courage to tell him, yes we appreciate your immense contribution to this great nation of Singapore. We will always remember and honour your legacy. But you are not a nation or the nation unto yourself. And so, the saddest and most unfortunate thing about the Viswa Sadasivan episode is one of lost opportunity. One which we may never have again for a long time. A small window was opened up – but was forcefully and immediately shut. All that most people remember of Mr Viswa’s speech is that it is one which riled MM. The importance of its content is lost. We thus have to question if it is fair for one single man, even one such as MM Lee, to wield so much influence that when he speaks, even ideas become silent. How does this benefit Singapore in the long run?